The Blue Poison Dart Frog is a small frog with bright blue coloring. Its back and top of the head are a lighter-colored sky blue, while its belly and legs are a darker blue color. 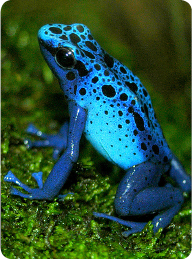 Dark blue and black spots cover the frog’s body, primarily its back and head. The sexes are similar in appearance, with females being slightly larger than males. A Blue Poison Dart Frog measures 1-1.5 inches (2.5-3.8 centimeters) long and weighs about three tenths of an ounce (8.5 grams). Poison Dart Frogs have toxins in their skin that can paralyze or kill potential predators. The bright blue color of this frog’s skin warns predators not to eat it. Blue Poison Dart Frogs are covered with a sticky skin that helps to hold in moisture and allows the tadpoles to cling to the adults while being moved between locations. In the wild, Blue Poison Dart Frogs eat primarily insects, including caterpillars, ants, beetles, flies and mites. They will also consume spiders and other arthropods. At Cosley Zoo, these frogs are fed fruit flies and crickets. Blue Poison Dart Frogs breed in February and March. The female lays 5-10 eggs at a time. The eggs are laid in moist areas, but are not completely submerged in the water. Tadpoles hatch 14-18 days after the eggs are laid. It takes tadpoles 10-12 weeks to undergo metamorphosis and become adult frogs. In the wild, Blue Poison Dart Frogs are found in Surinam, South America. They inhabit a few isolated areas of rainforest, choosing areas that are warm and humid, near a water source such as a stream. While they are able to climb trees, Poison Dart Frogs are typically found on the ground. These frogs are diurnal (active during the day). In the wild, Blue Poison Dart Frogs live for 4-6 years. In captivity, they can survive up to 12 years. The toxins in the skin of a Poison Dart Frog can be poisonous and even fatal to humans. However, these toxins may also be beneficial to humans, and scientists are researching them to see if they can be used in pharmaceuticals. Poison Dart Frogs have also become popular as pets. Only captive-bred frogs should be purchased as pets to preserve the wild population, which is threatened due to habitat destruction and illegal collection for the pet trade. Zoos around the world are working on conservation projects to protect the wild population of these frogs, which play an important role in the ecosystem as a predator of insects and other invertebrates. Each Blue Poison Dart Frog has a unique pattern of spots, much like humans’ individual fingerprints. The toxic compounds in the skin of a Poison Dart Frog come from its prey, especially the ants it eats. The compounds are absorbed into the frog’s skin when it consumes its prey. Because the frogs at Cosley Zoo are fed fruit flies and crickets, which do not contain these toxins, the frogs are not poisonous. Poison Dart Frogs have no webbing between the toes on their feet, so they are poor swimmers and are not often found in the water. The toxins by Poison Dart Frogs are applied to the darts and arrows used by some South American Indians for hunting. The poison helps to quickly kill the animals being hunted. Because the area it lives in is so remote, the Blue Poison Dart Frog was not discovered until 1969!